KNOXVILLE—Asian carp. Burmese python. Hemlock woolly adelgid. These are just some of the most destructive pests and the world's worst invasive species that raise the hackles of fisherman, farmers, and wildlife managers everywhere they invade. But how do they establish themselves and take over non-native species so effectively and efficiently? Knowing answers to these questions could help experts manage and control invasive species. In research from the National Institute for Mathematical and Biological Synthesis (NIMBioS) and the University of Ferrara, Italy, scientists have devised a new method for investigating the factors that contribute to biological invasions of non-native species. Such biological invasions can have dramatic consequences on the environment. The Japanese beetle known as the woolly adelgid has been eating its way through hemlock tree stands in the Eastern United States since it was first introduced there in the late 1950s. Giant Burmese pythons in south Florida are essentially taking over populations of small animals, as much as two-thirds of marsh rabbits, for example, and wrecking havoc on the food chain. Biological invasions can have economic consequences as well. Asian carp, which spread from Southern fish farms in the 1960s and 70s to wild habitats across the United States, quickly crowds out native fish species. Keeping this non-native fish out of the Great Lakes is estimated to cost up to $18 billion. In the new study, published today in the journal Heredity, researchers used genetic data to analyze multiple waves of a single biological invasion. The novel aspect of the new study is that the second wave originates from the same source as the first, whereas most studies consider a second wave originating from a geographically and genetically different source. Tested on simulated data across a large range of realistic invasive situations, the study's method was able to successfully use genetic data to correctly distinguish a two-wave invasion from a single-wave invasion. The method also correctly estimated the number of individuals that were introduced, and to some degree, the timing of introductions. Prior to this work, some researchers had suggested it might not be possible to distinguish multiple waves from a single source. This study—the first to examine this type of invasion— shows otherwise. Aside from testing the method on a variety of simulated, realistic invasions, the new method was also tested on introductions of bumblebees to New Zealand, which were established there more than 100 years ago. In two documented shipments of bumblebees to the island, in 1885 and 1906, the study suggested that one of these introductions failed to establish while the other did establish and became invasive. Distinguishing one from two waves of colonization could advance ecological understanding of biological invasions, such as why many non-natives take a long time before rapidly increasing. Being able to differentiate between waves could also help in the management and control of them. "Knowledge of whether second, or even third or fourth waves occurred in invading populations can help us better understand the dynamics of invasions. If second waves are common, managers could use this information to decide whether, how and when to isolate or eliminate small introduced populations," said corresponding author and NIMBioS postdoctoral fellow Sean Hoban. The results could be especially important for managing and controlling agricultural or aquaculture pests, Hoban said. In addition, the results have implications for plant and animal product inspection and interception of non-native species. According to the research, strict inspection could be important to continue even after first establishment to prevent further waves. 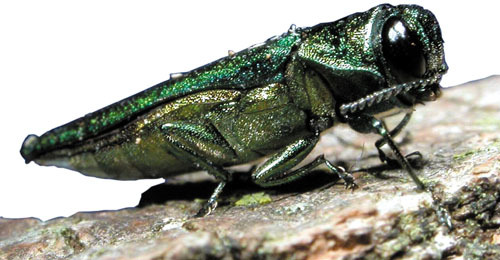 For example, recent public messages from the Great Smoky Mountains National Park aim to prevent further waves of establishment of emerald ash borer by prohibiting people from bringing firewood into the park from outside. In general, the authors emphasize that their approach could benefit much future invasive species work.